How much does it cost to go to Central Michigan? On this page you'll get a better understanding of what college costs you'll actually have to pay out of pocket, which can vary widely based on where you live and your income level. Few students will pay the full advertised sticker price of Central Michigan. The Net Price is an estimate of how much the average student actually pays to attend college for one year. To calculate this number we take the total cost of attendance of Central Michigan University including tuition, fees, room, board and other expenses. Then we subtract out the average amount of aid awarded per student. What is the Average Net Price for All Central Michigan Undergrads? The average student will pay a total net price of $19,714. Two important factors that affect the net price you will pay to attend Central Michigan University are where you will be living, either on-campus or off, and whether or not you will be receiving any grants or scholarships. $19,714 is the average net price across all students. Your price may differ depending on your family income level. The average net price of $19,714 is based on estimates from 2017. This number represents the overall average net price of all in-state undergraduate students, including those that did not receive any financial aid. 100% of freshman students paid in-state tuition. Of these in-state students, 81% received an average of $8,503 in grants and scholarships. This resulted in an average annual net price of $15,156 for on-campus students. The following table explores the likelihood that you too will receive some common price-reducing aid, based on percentages. The above refers to grants and scholarships from the college and/or the state, federal or local governments. Other sources of grant aid such as private scholarships are not included. Use the College Cost Estimator to get an idea of how much money you may have to spend out of pocket to attend Central Michigan, and how many loans you may have to take on. Select the factors that are true for you. This is what the college will likely charge you in this scenario. Money given to you to offset the cost of college. This is what you can expect to pay (or pay back). Money you borrow to cover the cost of college. You will have to repay this eventually. Money you need to come up with each year to attend college. How much will you be relying on loans to finance your education? Research the average amount of loan debt students take on from this school. Family income can have a large impact on the amount of aid you receive, and thus, your net price. The table below shows the average net price freshmen paid based on income level. Note that if the school offers in-state tuition, the lower in-state tuition has been used in the calculation. The above table only includes the calculated net price for students that received some form of Title IV aid. Title IV of the Higher Education Act of 1965 establishes general rules that apply to the student financial assistance programs covering grants and loans. 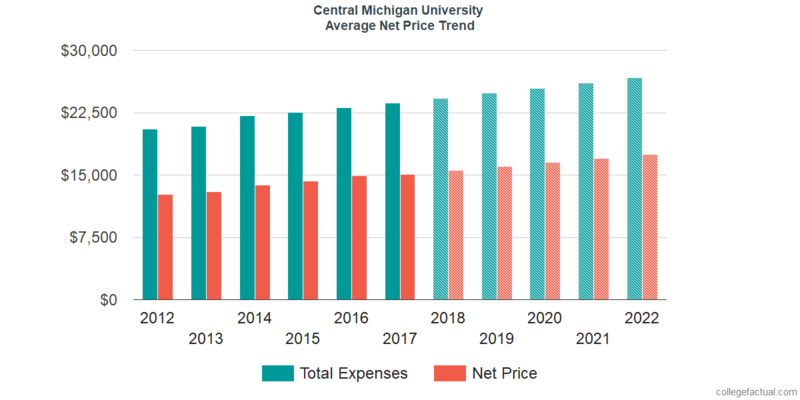 Over a period of six years, the average net price paid by all freshmen at Central Michigan University has increased by an average of 3.0% per year. 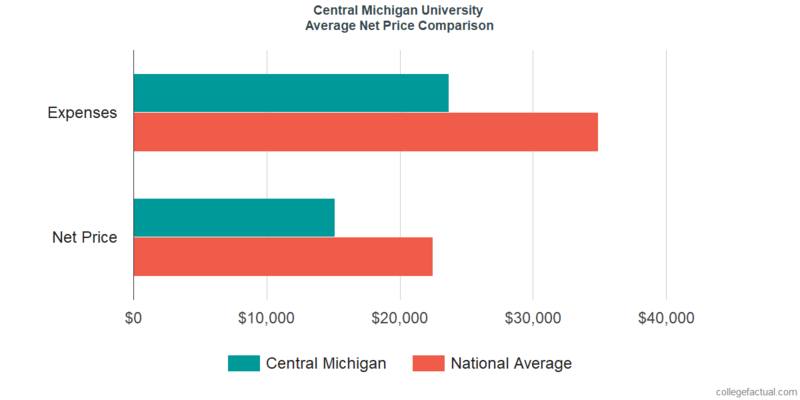 Is Net Price at Central Michigan Below Average? An overall average net price of $15,115 puts Central Michigan University below the national average of $22,482. Many schools offer more aid to first year students (freshmen) than they do to other undergraduates. Is that the case with this school?